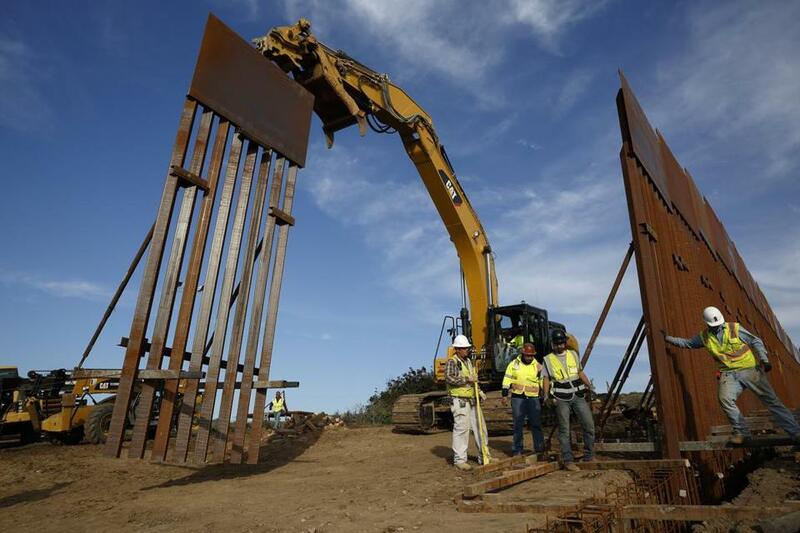 Construction crews installing new border wall sections seen from Tijuana, Mexico. What started as an online fund-raiser to provide President Trump with donations for his southern border wall has morphed into a new foundation whose members vow to build a wall themselves. The "We The People Will Build the Wall" campaign has surpassed $20 million since it was created in December by Air Force veteran and triple amputee Brian Kolfage. Two-thirds of Americans oppose President Trump declaring a national emergency if Congress doesn’t offer up the funds he wants to build a wall on the US-Mexican border, a CBS News poll released Sunday shows. Most survey respondents — 73 percent — also said they want Trump to continue negotiating while keeping the government open, rather than forcing another shutdown when funding expires again in mid-February. A congressional committee is trying to reach an agreement on border security after the record 35-day government closing ended Jan. 25. Trump has said in recent days that negotiations are a ‘‘waste of time’’ because Democrats don’t support wall funding, and he said in an interview that aired Sunday on CBS that another government shutdown or declaring a national emergency remain viable options. Republican lawmakers appearing on Sunday morning political shows pushed back on the prospect of an emergency declaration, saying they want the border funding issue to be settled through the normal appropriations process. Senator Richard Shelby of Alabama, chairman of the Senate Appropriations Committee, said that while Trump has the power to declare an emergency, it would probably have to be decided by the courts. While 66 percent of Americans in the CBS survey oppose Trump declaring a national emergency to pay for a border wall, half of Republicans said he should demand funding, even if it means another government shutdown. Sixty-five percent of Democrats want their party to continue negotiating with the government open, the poll found. The survey was conducted by YouGov using a nationally representative sample of 1,596 US residents interviewed online Jan. 28-31. The margin of error was plus or minus 2.6 percentage points. ‘‘For those who have not received a personal apology yet — I’m sorry,’’ he wrote. Before being appointed Florida’s top elections official by Governor Ron DeSantis, he was the elections supervisor in Seminole County, a suburb of Orlando. Virginia Governor Ralph Northam is under pressure to resign after his medical school yearbook page was made public, showing a person in blackface and a person in Klan regalia. In an interview with CBS’s ‘‘Face The Nation’’ slated to air Sunday ahead of the Super Bowl, Trump said Pompeo told him he was not leaving his current position and voiced confidence that he would not bolt to pursue a Senate seat in Kansas. ‘‘I asked him the question the other day. He says he’s absolutely not leaving. I don’t think he’d do that. And he doesn’t want to be lame duck,’’ said Trump. The Washington Post reported last month that Senate Majority Leader Mitch McConnell personally courted Pompeo to consider running in a telephone call, according to two people familiar with the conversation. Pompeo later confirmed the discussion. Senate Republican leaders and their allies contend that Pompeo, who represented Kansas in the House before joining the Trump administration, could clear the Republican field in the contest for retiring GOP Senator Pat Roberts’s seat and spare the party a potentially divisive and costly primary. Maine Republican US Senator Susan Collins had the best fund-raising quarter of her career after she delivered a pivotal vote that helped seat Brett Kavanaugh on the Supreme Court, according to documents filed with the Federal Election Commission. She said the campaign received ‘‘many contributions’’ from Maine that were under the $200 reporting threshold. Collins’s decision to support Kavanaugh’s nomination led to a burst of donations for a potential 2020 challenger. So far no Democrats have emerged to challenge Collins next year.